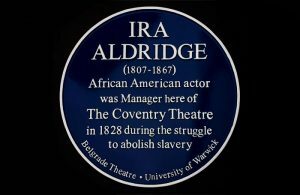 On 3 August 2017 a blue plaque is to be unveiled in Coventry commemorating Britain’s first non-white theatre manager, Ira Aldridge, exactly 150 years after his death. I’ve written blog posts before celebrating Aldridge’s work as an actor in Shakespeare’s plays. He was a sensation as Othello and Aaron, his skill surprising some of those who saw him and assumed a man of colour’s acting could not compare to that of a white man. Aldridge made his name acting in London but he performed many times on provincial stages. In 1851 he even performed in Stratford’s little theatre, the first black Othello to perform in the town of Shakespeare’s birth. This was not to be repeated until 1959 when Paul Robeson took the part. During his considerable UK career he toured widely. Aldridge’s role as a theatre manager is less well-known, even though short-lived. In 1828 he ran Coventry Theatre, an achievement even more extraordinary for a black man than performing in Shakespeare. The Stage journal notes that the blue plaque being unveiled on 3 August is the result “of a campaign to recognise Aldridge’s contribution to theatre and to the city, with support from the Belgrade Theatre Coventry and Warwick University.” It highlights the fact that ethnic diversity has been part of Coventry’s history for centuries and celebrates the contribution that people of Coventry made in 1828 to support the abolition of slavery. The plaque will be unveiled by Coventry’s Lord Mayor at the site of the original theatre, the guest of honour being the 99-year-old Bermudan actor Earl Cameron. In an extraordinary link with the past he was taught acting by Aldridge’s daughter and he went on the be one of the first black actors to perform in mainstream film and television. The campaign began last November when, after a torchlit procession, flowers were laid at the site. Those taking place included RSC Associate Artist Ray Fearon who had played Aldridge in the drama-documentary Against Prejudice. It was moving. The Black Youth Theatre sang songs that Ira Aldridge himself performed on that spot nearly two centuries ago, and they sang them to a gentleman who knew Ira’s daughter. Three generations came together to honour a forgotten moment in our multicultural past. 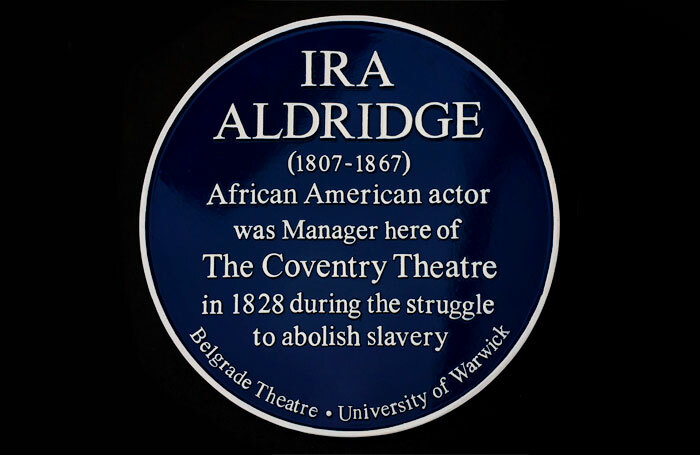 In January 1828 Ira Aldridge was advertised as a fairground attraction: A Most Extraordinary Novelty, a Man of Colour, yet only a few weeks later Coventry gave him the keys to its theatre. It was obvious there had to be a permanent memorial. The building Aldridge managed was demolished long ago, and the Blitz even destroyed the streets around it. So the plaque marking the site will be in the heart of modern Coventry, in the Precinct. Every day hundreds of shoppers will be reminded of a great African American and of the city’s openness to “foreigners and strangers”. The site is at 43-47 Upper Precinct, Coventry City Centre. Participants will set off from the Belgrade Theatre at 2.15 for the ceremony timed to start at 2.30. A reception will follow back at the Belgrade and people are encouraged to join in. There is also to be a linked event at the Sam Wanamaker Playhouse at Shakespeare’s Globe on September 19 at 7pm. 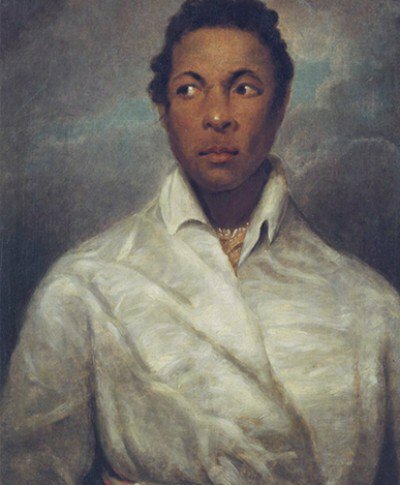 The drama-documentary Against Prejudice: A Celebration of Ira Aldridge, is to be performed, followed by a discussion with historians and performers sharing their perspectives on his importance. This entry was posted in Legacy, Shakespeare on Stage and tagged Belgrade Theatre, British Black and Asian Shakespeare, Coventry, Ira Aldridge, Sam Wanamaker Playhouse, Tony Howard, University of Warwick. Bookmark the permalink. Current RSC actor Jospeh Mydell made a beautiful short film of Aldridge’s life. There was a seat dedicated to Aldridge in the pre-2007 RST, paid for by American actors. Sadly, not replaced in the new RST. Joseph Mydell will be at the event at Shakespeare’s Globe (on September 19th, to talk about his film. I didn’t know, though, that the RST plaque is not in the new auditorium. RSC publicity mentions it as late as last year. Does anyone know where it is?